You honestly do want to read it. You spent the money on it. It’s just sitting on your desk or your shelf. Very innocently. But making you feel guilty. Last week, some of my HBG colleagues and I – independent of each other – watched a vidcast of David Callahan and Emmett Carson in a fascinating, spirited, and sometimes provocative debate sponsored by Philanthropy New York. 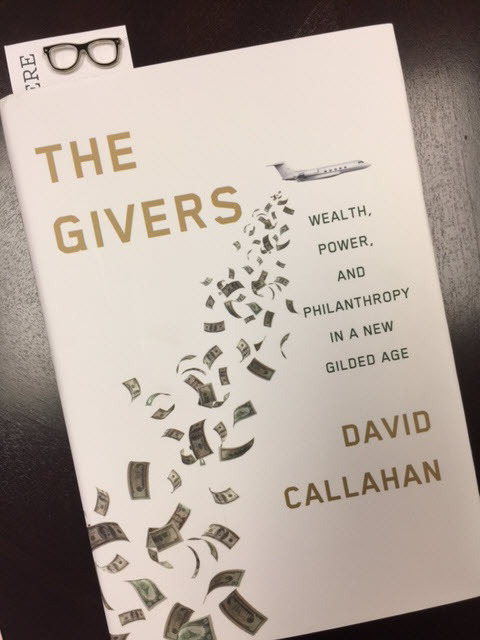 Callahan is the founder and editor of Inside Philanthropy, and author of the new book The Givers; Wealth, Power, and Philanthropy in a New Gilded Age. Carson is president of the Silicon Valley Community Foundation, the largest community foundation in the world, with $8 billion+ in assets. I was fascinated by the discussion. The debate was so interesting and informed! I really wanted to talk with someone about it. Later that afternoon one person mentioned it in our group chat. Then another. And then all of us who watched the debate got in on the discussion. And before we knew it, we had decided to create a separate chat room and an HBG book club to read Callahan’s book together. Our first meeting was this week – our assignment was the prologue and chapter one. Our conversation was supposed to last 15 minutes, but we had enough discussion from those two sections alone to last us 40 minutes. As we were talking, I couldn’t believe we hadn’t done it before! Book clubs are ubiquitous, but sometimes you end up ‘forced’ to read books that you would never in a million years pick up on your own (and won’t miss when you’ve read the last word). But a work-book club! What a great way to ‘force’ yourself to read a useful book to increase your career knowledge with a group of people who are also pre-disposed to be interested in it. We’re going easy – our schedule is one chapter a week. Next week we’re each going to bring one thing that we found interesting or important from the chapter to discuss. If you’ve got a work-book on the shelf that you really do want to read, why not enlist other readers in your office or department (or chapter!) to help you crack it? It’s almost summertime, let’s get going on that summer reading list! You can watch the replay of the Callahan/Carson debate by clicking here. Please note that the link first provides you access to a 9-minute version of the video titled “Emmett Carson on the New Philanthropists.” You must hit the right-arrow within the video to go the full 2 hour debate. A New York Times review of The Givers can be found here.